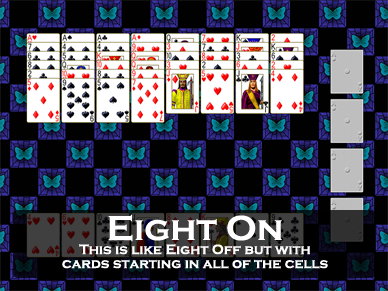 Click on the screen shot of the game Eight Off from Pretty Good Solitaire to download the 30 day free trial version. 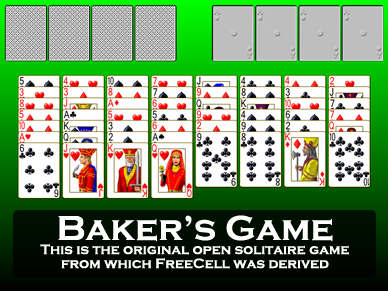 Eight Off is a popular FreeCell type game. 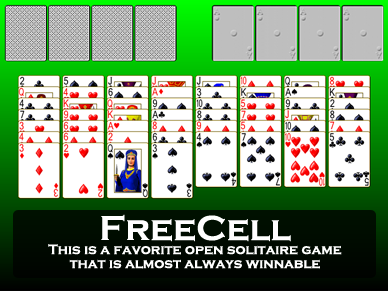 My version of Eight Off in Pretty Good Solitaire or FreeCell Plus allows you to play offline, full screen, with complete undo and my unique right click quick move. It's the best way to play solitaire! Eight Off for Windows 10 or Mac! In this video I explain how to play Eight Off. Download Eight Off Now and play along! At the start of the game, six cards each are dealt to eight tableau piles. There are also eight cells, four of which are filled at the start with cards. There are four foundation piles which are to be built up in suit from Aces to Kings. The game is won when all of the cards are moved to the foundations. 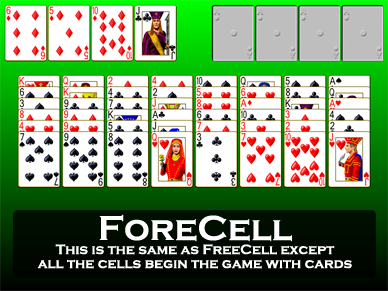 The eight cells work just like the cells in FreeCell. Each cell can contain one card and any card may be placed in an empty cell. In the tableau, building is down by suit. Only one card a time may be moved. However, as in FreeCell, there is a shortcut where you can move groups of cards as a unit if you have enough empty cells available where you could move each card individually using the cells. Therefore, it is helpful to have as many cells empty as possible. Empty tableau piles may be filled only by a King (or a legal group of cards headed by a King). 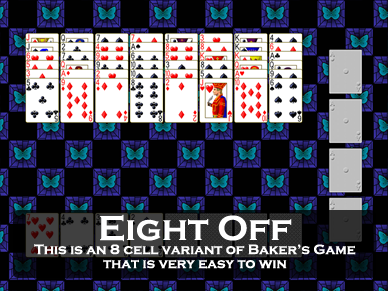 Eight Off is much like FreeCell in that nearly all games can be won with enough effort (there are some unwinnable games, but they are rare). As such, it is nearly entirely a game of skill and strategy.